In this lesson, we will learn how to detect alpha, beta, and gamma radiation and what materials are effective at stopping different types of radiation. What is the name of the instrument that can be used to measure the level of radiation in an area? Which material is suitable for lining a box that is used to store a radioactive source? Which type of radiation has the shortest range in air? 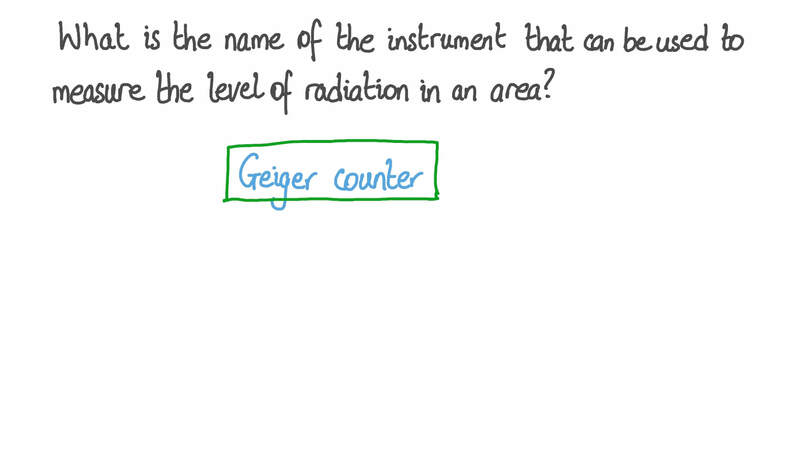 Which type of radiation has the greatest range in air? Which of the following is the approximate range of gamma radiation in air? AThe range is too long to be measured. What is the approximate range of beta radiation in air? What is the typical range of alpha radiation in air? Which of the following types of radiation have no electric charge? Which of the following types of radiation is negatively charged? Which of the following types of radiation is positively charged? Which of the following types of radiation would be stopped by a 5 mm thick sheet of aluminum? Which of the following types of radiation would be stopped by a thin sheet of paper? Which type of ionizing radiation is most easily absorbed? Which of the following is the correct definition of ionization? AIonization is the process by which an atom or a molecule becomes electrically charged by losing or gaining electrons. BIonization is the process of an unstable nucleus emitting a gamma ray. CIonization is the process of multiple charged atoms or molecules grouping together. DIonization is the process of an unstable nucleus decaying and emitting a charged particle. EIonization is the process of charged atoms or molecules becoming electrically neutral. Which unit is used to measure the number of decays of a radioactive sample per second? Beta radiation can be used to measure the thickness of aluminum foil during production and to automatically control the speed and pressure of the rollers that press the metal into foil. This is shown in the diagram. The Geiger counter measures the amount of radiation that comes through the foil from the beta source on the other side. The Geiger counter is connected to a system that controls the rollers.